Also known as Ndebele stitch, it is the traditional beading stitch of the South African Ndebele tribe. They create the most amazing beadwork in colorful, geometric patterns which they also paint onto their houses. I imagine a beautiful village full of vibrant color and pattern where women sit in a circle and bead … idea further by placing the embedded beads in a random pattern. Does anyone know how to do free-form herringbone? That’s another idea I’d like to play with. Beading Daily. This weave is often found in Ndebele beadwork. The herringbone stitches or pattern creates a tough fabric. It’s a tricky stitch, but once you get the knack, it can produce wonderful geometric shapes. Beading Daily usually wows with their beading patterns. Their latest free eBook is no different. These 6 beading patterns focus on herringbone stitch (Ndebele) and right angle weave (RAW) although other stitches are used. Another bead weaving stitch I enjoy using is herringbone. This is a short demonstration of that stitch using 1mm round crow beads. Cylinder beads work very well for this stitch too. Hope you enjoy it! www.jewelrysupply.com In this JewelrySupply.com video, you’ll see how to create this extremely durable stitch that is also wonderfully flexable! Tubular herringbone is versatile and very easy to work up. 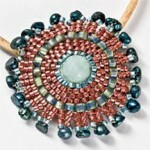 In this tutorial, I use size 11 round Toho seed beads to cover a satin cord. You can use rounds or cylinders to work this stitch.